Insiders say your club is embarking on “arguably its toughest pre-season ever” with a number of players “training the house down”, some even with clothes on. 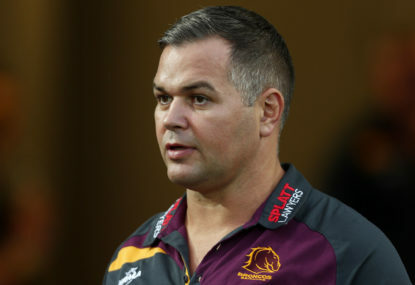 The 2019 rugby league off-season has seen a unique range of extra-curricular practices introduced that have radically spiked workloads, especially for Todd Greenberg and pixels. While most of us are cooling off at the beach, coaching staff have been on the training track “leaving no stone unturned” in pursuit of the ultimate dream: a premiership that can be later jeopardised by systematic cap cheating. Players have returned after the Christmas break and are said to be tracking nicely for the season proper, with confidence high they can wrap-up Mad Monday by Round 1. Conditioning staff have been most encouraged with early beep test results, with the majority of players able to complete the exercise without being de-registered or imprisoned. 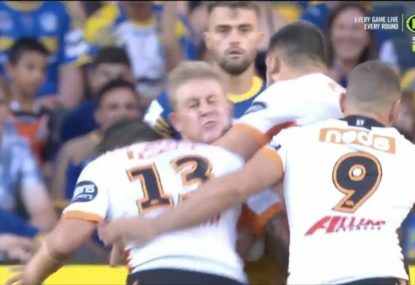 Do refs and touchies really have problems with their eyesight? Team doctors are also delighted to report a clean bill of health that will see the entire squad enjoy a full pre-season, with the only interruption to come from an alcohol-related incident on Australia Day and an old millionaire with a plate of flour. One particular player – dogged by off-field issues and on his seventh and final chance – is reportedly in the “best shape of his career”, crediting a new training program that sees him boxing three times a day inside various pubs against security. New summer signings are also settling in nicely with the existing squad, with bonds already forming through a series of intensive sessions on sandhill climbs and time trials. One particular recruit was even seen pushed to the point of physical illness after “being taken to a dark place”, which was believed to be the team’s WhatsApp group. The head coach of the club – speaking on the condition of anonymity due to his ban from coaching – declared the team is looking to harness the pain of its meek finals failure of last season. He revealed many of the group remain tortured by an “exit that still burns”, although he conceded they could be referring to symptoms from the rampant end-of-season trip. The coach also announced his new leadership group of five joint-captains. This decision is in line not only with modern trends, but because he is “genuinely unsure” how many will flee for the NFL or punch a cabbie before the season starts. One of the captains spoke of his desire to “deliver long-term success” for the club after signing a new five-year deal, even though this deal was signed with another club. While admitting this was a “specialised contract”, he did reveal planning on becoming homesick next month. On the tactical front, coaching staff have also travelled on overseas fact-finding missions to canvass new training techniques. This is in a bid to provide an edge over rivals in rugby league’s ever-evolving market of obscure off-season trends. As a result, this has seen the club adopt a state-of-the-art simulation program that allows players to hone ball skills while on civil proceedings or sober, and to conduct a boot camp inside a Double Bay nightclub. Players have also been directed to perform community work, with many encouraged to consort with unregistered organisations that are identifiable to police and can guarantee suspiciously impressive skinfolds or muscle mass. The program also involves players being subjected to rigorous testing, with bans imposed on those who register negative readings for tequila or fingerprint ink. 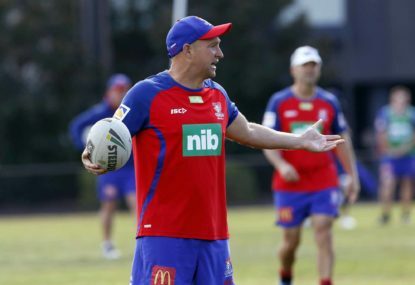 While coaching staff admit the training scheme could “raise eyebrows” or “be illegal”, they make no apologies for moving with “footy’s changing landscape, where the nightly news has more naked Bulldogs than Clive Palmer ads”. Dane was named best and fairest in the 2004 Bathurst mixed indoor cricket competition. With nothing in the game left to achieve, he immediately retired at his peak to a reclusive life ensconced in the velvet of organised contests. 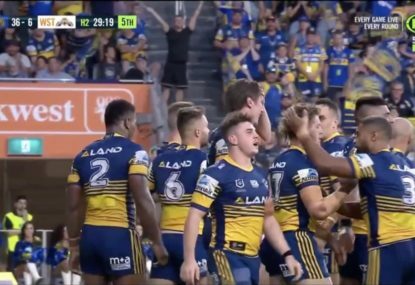 Parramatta sealed victory over the Tigers with this Reed Mahoney try. 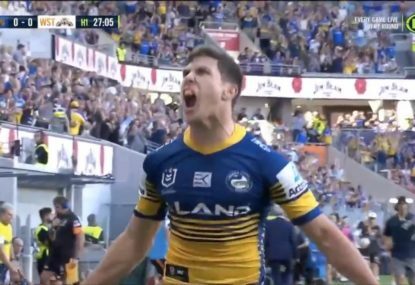 Mitchell Moses ran half the pitch to score the first NRL try at the new venue. 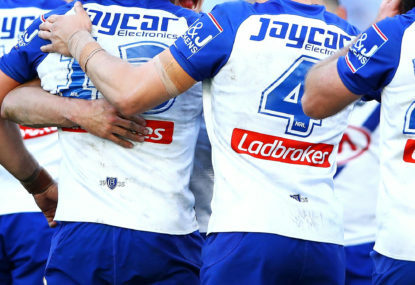 I tell you what, at this point in this season I would prefer to support the Canterbury Bulldogs than the Newcastle Knights or Penrith Panthers. That was a shocker. Errors across the paddock, three of which lead the Titans to score, down by 22 at halftime and a severe lack of aggression in the first 40. I couldn’t believe what I saw.